There are people who love their car and then there are car lovers—those who live and breathe classic cars. From antique cars to fast and furious classic hot rods, each has an image in his mind of his weekend dream date … his metallic main squeeze. And once he’s found his perfect vehicle, he’ll want to keep it protected and pristine as he works to restore it to its former glory. Does this sound familiar? Whether you’ve found the car of your dreams or you’re still looking, try these tips to retain the value of that classic. 1) Buy the right car. Do some research before your purchase to see what makes and models hold their value consistently over time. Also, look for a car that is easy to restore. If financial retention is what you are striving for, avoid purchasing a vehicle that does not run, has substantial rust damage, or has been sitting uncovered for years. These high-dollar issues will eat into your profits. The right classic car can make a great investment—and an extremely enjoyable one, at that. 2) Focus on the original. One of the most exciting parts of owning a classic car is restoring it to its stunning, original condition. Avoid too many modifications that take away the timeless splendor of the original vehicle. And when possible, use as many original parts in the restoration process as you can. Any original part or detail can incrementally increase the value of your purchase. 3) Keep the interior looking (and smelling) pristine. The interior of your vehicle is just as important as the exterior in terms of value retention. A beautiful dash, flawless leather or upholstery, and a fabulous steering wheel will have all your car-loving friends rejoicing. But one thing that can ruin your beautiful interior is a smell that cannot be erased. Smoking, eating in the car, or other odorous activities chance penetrating the interior of your vehicle with smells that won’t go away. So, save that smoke (or lunch break) for the great outdoors. Your upholstery and your pocketbook will thank you. 4) Keep it hydrated. Just like the human body, your classic car must stay hydrated. Keep the fluids in check and make sure to drive your vehicle at least once or twice per month. Consistent use will help keep your vehicle in tip-top shape and will help the fluids circulate. This will also help keep the seals from drying out and creating messy leaks in and around your vehicle. 5) Watch the mileage. A beautiful Sunday afternoon drive behind the wheel of your gorgeous four-wheel-crush can be the moment you look forward to all week. However, using your car as a daily driver is probably not the best idea. Keep the odometer reading low. Minor mileage accumulation will translate to retained value through the lifetime of your car. 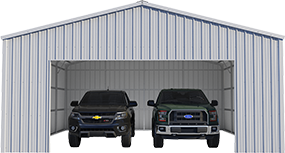 6) Always keep your car in a secured garage. 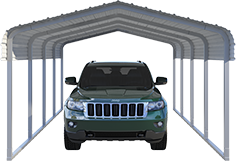 The best way to protect the exterior of your car is with a securedgarage from VersaTube. The harmful rays of the sunlight are extremely hard on your classic car’s paint job. Depending on your area of the country, high winds, sand storms, hail and ice, or corrosive ocean salt water can also wreak havoc on your magnificent vehicle. To retain the value of your classic car, make sure you have the best garage possible. 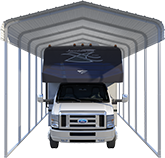 At VersaTube, we offer the best covering for your car. Just choose from one of our standard garage kits, or design your custom build with our Design Your Own tool. VersaTube Building System kits are pre-engineered, pre-cut, and designed with our patented Slip-Fit connection system so all the pieces slide together quickly. Assembly is simple enough that 2 - 3 people with no prior construction experience can assemble them. The DIY kit includes all the steel tubing components required to create your structure frame plus the screws, fasteners, and other small parts needed for assembly. Just finish it out with the secure doors and materials of your choice. Not only will you have an amazing place to store your classic car, you’ll also have an exceptional place to work on it! Questions about how to protect your classic car with a garage from VersaTube? Our expert engineers are just a phone call away. Call us today at 888-889-9611 to start planning the place where your classic vehicle will love to live—and you will love to work.